Amaze your visitors with this truly fascinating snapshot of the past. 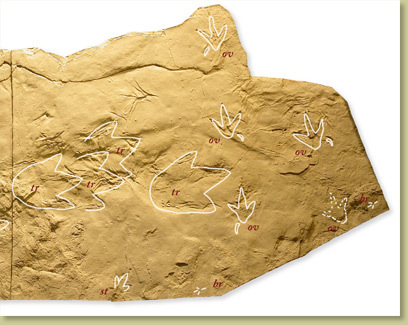 This Cretaceous trackway holds the footprints of some of the most famous dinosaurs of all time. These tracks were formed in and around an oxbow lake during the Maastrichtian Period. Some portions of the trackway surface preserved evidence algal colonies that were also present at that time. 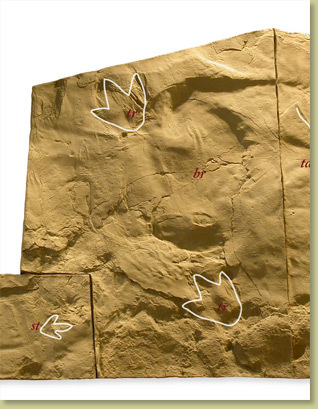 Maastrichtian dinosaur footprints are very rare, and it is believed the presence of the algae is the reason this astounding sequence of tracks was so well preserved. The dinosaurs involved in this still-life moment from the Cretaceous are Tyrannosaurus rex, Edmontosaurus, Struthiomimus a Caenagnathid and several small unknown birds. Section 'B' has two Tyrannosaurus rex tracks and one bird track. ~ 85” w x 115” l (216 x 292 cm). 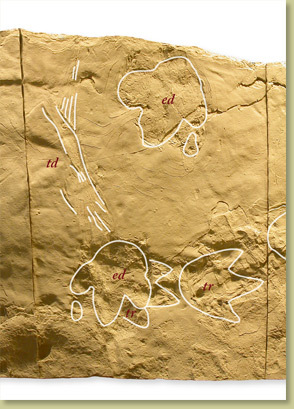 Section 'C' contains two Tyrannosaurus rex tracks, two Edmontosaurus sp. tracks, and one tail drag.) The Edmontosaurus tracks in Section 'C' are so well defined, even the texture of the footpads was preserved. ~ 81.5” w x 115” l (207 x 292 cm). Notes May take approximately six months for delivery. Check with us to see if an earlier delivery is possible. Size Overall size: 8’ 11” w x 40’ 5” l (2.7 x 12.3 m) Ships in 6 pieces.